Carrie began writing at the age of ten when she learned it was easier to invent exotic adventures on paper than to experience them in her rural Northern California one-traffic-light town. After earning a bachelor’s degree from Sonoma State University, where she majored in communications and wrote for the newspaper, she began a career in pharmaceutical sales. Along the way Carrie married her college sweetheart, Josh, became a mother to daughter, Jillian, and son, Lars, and dabbled in competitive running. The hours pounding the pavement gave her plenty of time to compose in her head. Carrie’s love for writing, throughout the years, has remained a constant. Her memoir is a candid portrait of a young woman in search of what she lost, and what truly matters as she raised her young family. Our pledge today was led by red badger Steve Marburger. Our thought for the day was given by Don McMillan, who offered various quotes from Winston Churchill, Robert Louis Stevenson and Anne Frank (an interesting group) and a poem he got off a sign in someone’s yard. Layne Bowen reported a complete absence of visiting Rotarians. I guess they don’t care about our membership issues! President Mark brought his lovely wife Mel Konrad. Debi Zaft asked the question and Julia Parranto got the answer, and the fact that Julia was sitting next to Debi had nothing to do with it! Debi threatened us all with fines in the future if more of us don’t know the answer, so pay attention and read your magazine! 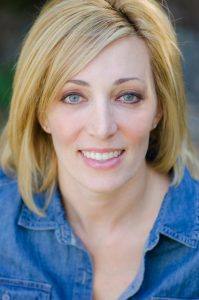 Cathy Vicini, in addition to making very fine wine, is a licensed counselor. She talked about her evolution from treating people with multiple personality disorders to coaching people to make good life choices. She uses a business-based approach to help people move on from their issues so that they don’t stay stuck. She encouraged all of us to reach out if we are feeling stuck. Laura Held is substituting as birthday person for Elizabeth Karbousky, who recently gave birth to a baby girl. January babies were notably absent, with the notable exception of Steve Olson, who got a special singing of Happy Birthday and a nice box of fortune cookies. Paul Hamilton announced a pot of $405 and pretty good odds: today we had two good marbles and one bad?! The lucky ticket belonged to Rich DeLambert, who managed to draw a good marble and win the pot! Pres. Mark wants us all to know that if we need to reach him he can be contacted at president1415@SantaRosaRotary.com; or P.O. Box 10, Santa Rosa, CA 95402. Cathy Vicini is hosting our Rotary Social this month at the new Trecini Winery Tasting Room, on Friday, January 16th, from 5:00 p.m. to 7:00 p.m. Trecini is located at 684 7th Street, which is at the corner of 7th St and Humboldt St in downtown Santa Rosa. Be there! Cathy’s getting some special wine from Costco! No need to bring anything, but if you want to, that’d be great. Ted Wilmsen wants us all to pick up our dictionaries today! Some still need partners, so call Ted if you can partner with someone. Bring back your extras if you have any. Wayne Rowlands announced a Rotary Means Business event tomorrow night (Thursday, January 15th) at the Signature Wine Lab. Doug Johnson says Monday, January 26th is the date the Giro Bello will be open for registration; a lunch meeting will be held Thursday, January 22nd, at Carmen’s office at 565 West College Avenue, which is the DeMeo, DeMeo & West firm. All interested in getting involved in our signature fund raising event come on down! 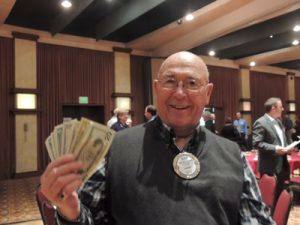 Rotary Bux: President Mark acknowledged the hard work of our very own Chip Rawson, who spent hours and hours working on the Laguna this past weekend, and also does a lot of work at our meetings. Chris Andersen got called out for mis-spelling the names of some of our winners last week in the Bulletin. (This editor would NEVER make that mistake!) Chris whined and pointed fingers at the proof-readers and then coughed up $25. Don McMillan is a tight wad and the most tight lipped lawyer around, but eventually got Jackie McMillan in the act, who said the couple would give $25 each for their recent trip to San Diego. Thanks Jackie! Shannon McConnell isn’t getting fat, she’s just producing grand-children, per proud gramma Jane Duggan; the child will be a boy, and he will be named Marshall. That got a nice round of applause! Peggy Soberanis took a nice ski trip and also celebrated her mother’s 100th Birthday! That was worth $50! Matt Fannin made an important announcement! won a gold medal. The John Brown memorial scholarship is the beneficiary! Way to go! Matt Fannin announced that on April 14th he and his wife will have a baby girl! The news came to them via a telephone call while they were out shopping! Doug Chase told a story about a heart attack, 2 weeks in Hawaii, and a bus trip. Some thought he should be fined for not driving his father in law, Bob Sorensen, to the airport. Kathleen Archer and her lovely husband Bill took a trip to Nebraska. And had fun! Who knew it was possible!? Craig Meltzner is now the Treasurer of the Country Dance Society, a big honor! Sam McMillan had rotator cuff surgery last week and paid for it. Darrell Horn told us about a harrowing stint at the hospital; abdominal aorta surgery – 50% chance to make it, and he did! Months later, he competed in the long jump and got 2nd place! Nice recovery! Director Jack Tolin gave us a Leadership Moment to start off our program since our program is focused on membership, which is one of Jack’s committees. Jack is Director of Club Service I (although he didn’t seem to know that…), which includes Membership, Red Badge, Rotary Info, and Magazine. Jack stressed the importance of getting new members involved early on in their Rotary experience. We can all help with this by making red badgers feel welcome. Go Ducks! President Mark then tried to scare us with some charts. New members come in, but more people leave. Got to stop the losses! Otherwise, we turn out the lights in 2023. So we have a new Membership Committee with new ideas, being led by Matt Fannin. The Committee was introduced and included Matt Fannin, Robert Pierce, Julia Parranto, Rich deLambert, Ginny Cannon. The new Membership Committee is focused not just on recruiting new members, but also on retaining existing members. Robert Pierce announced a liaison program, where new members and existing members can liaise with the Board through designated individuals in an attempt to have better communication throughout the Club. 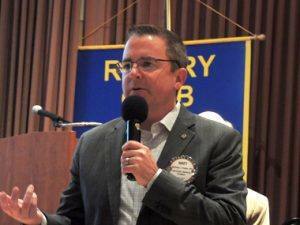 Rich deLambert talked about recruiting new members. Rich exercised the crowd by having all who have ever brought a guest to a meeting stand up, and then all who have ever talked to someone about becoming a Rotarian to stand up. Rich talked about the importance of classifications. We need more variety; there are 7 different areas that areoverly represented. There’s no one from the City or some of our major corporations like Agilent or Medtronic. Rich asked for names of potential Rotarians. Just give the name to someone on the committee, and they will recruit that person for you! Rich also encouraged us to all wear our Rotary pin every day. Think Membership! President Mark talked about other groups we may belong to, like Scoops. 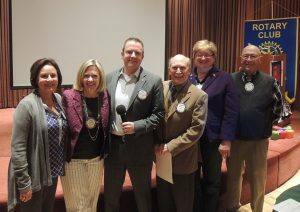 Ask people in your other groups, whether BNI or church or whatever, to join our Club if you think they’d make a good Rotarian. 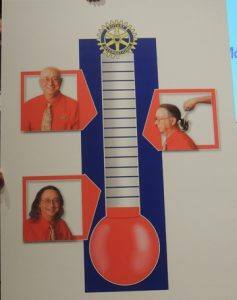 A handy card was passed out which included a list of various classifications that we don’t have represented in our Club, as well as a list of the costs involved in being a Rotarian. Challenge #1: if our Club ends up with a net 6 member gain, then bye-bye pony tail! Challenge #2: if we get a net gain of 8 members (beating Donnie Mac’s year), then all his hair goes! We need great programs! If you have a great idea, see Wayne Rowlands or Shannon McConnell. Shannon McConnell spoke to the need to publicize our involvement with local programs, which many are not aware of, but if known, could help us recruit new members. Another reminder that we don’t all know all that the Club accomplishes. Rich deLambert reminded us that group memberships are still on the table, which means that if the CEO can’t attend, then she can send an underling to the meeting. President Mark ended the meeting by thanking Greeters Emily Harrington and Peter Holewinski, Lunch Ticket Taker Dan Schell, Lunch Ticket Sellers Steve Dunn and Ray Giampaoli, Raffle Paul Hamilton, Scribe Julia Parranto, Microphone Jockey Cathy Vicini, and Visitor Mel Konrad.